Is Abiel Bag Co. coming to Muscatine? News doesn’t usually just happen at your desk. Through the years, I’ve offered that bit of advice to an untold number of reporters. So guess what happens when an old news guy at heart no longer has an office … or a even a desk? He wanders out and maybe finds a story. 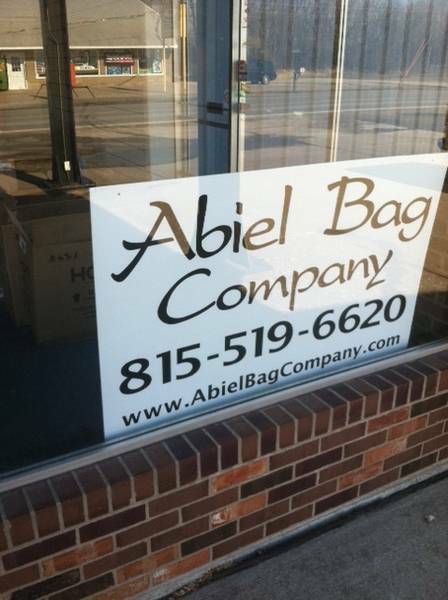 In this case, it appears Abiel Bag Co. is coming to Muscatine. 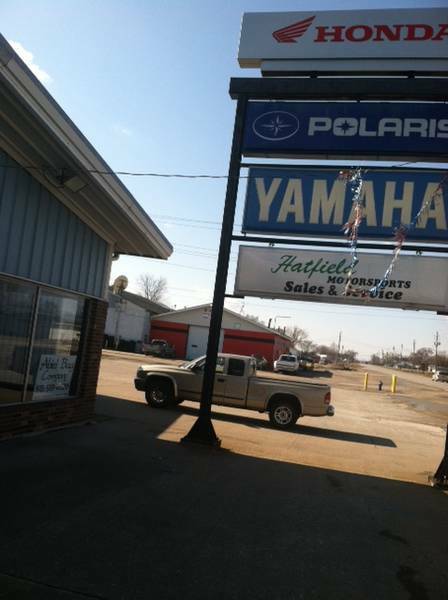 The company has put a sign — with its name, a website address and telephone number — in the window of the former Hatfield Motorsports at 1108 Grandview Ave. Since 2010, the building has been owned by Community Bank in Muscatine, which acquired it in foreclosure proceedings, according to county records. The building has been vacant since about that same period. I’m told Abiel Bag will employ 10-12 people in Muscatine. But I don’t know much about the company or its plans. The website address listed on the sign doesn’t appear to be active. A man whose name I did not catch returned the call I had made to the telephone number on the sign in the window. He said the plant, which should be running in two to three weeks, will make bags for the company’s liquid division. The plant will start out by making bags for liquids produced by Grain Processing Corp. and other local companies. It could eventually expand into making bags for sand, gravel and other similar materials. Anyone who is interested, the man said, should stop by and fill out an application. Is a Chinese leader coming to town? Is a mystery bag company coming to town? What I want to know: Is an Iowa-made Gomaco Trolley replica coming to town? That would be real news! I just updated it a bit, Dan. There’s not much more, but it does sound like good news. Abiel Bag Company is going to sew bags to serve the sand and gravel industries in the Muscatine.area. It is a transitional employment opportunity to serve individuals served by the Mighty X Men and Mighty X Women ministries based in Rockford, IL.The Mighty X Women is already active and seeing some success, helping individuals who have reentered the community after jail or substance abuse. These programs achieve success because while they help people who are ready for spiritual growth, they address other issues such as housing, substance abuse, family relationships, transportation and employment. This is where the bag company will serve. Thanks for the added information, Paul. It looks as if we’re maybe learning as we go about how you’re supposed to do some real journalism using social media. I have to say I really like this. Wish I was smart enough to figure out how to make a living doing it.